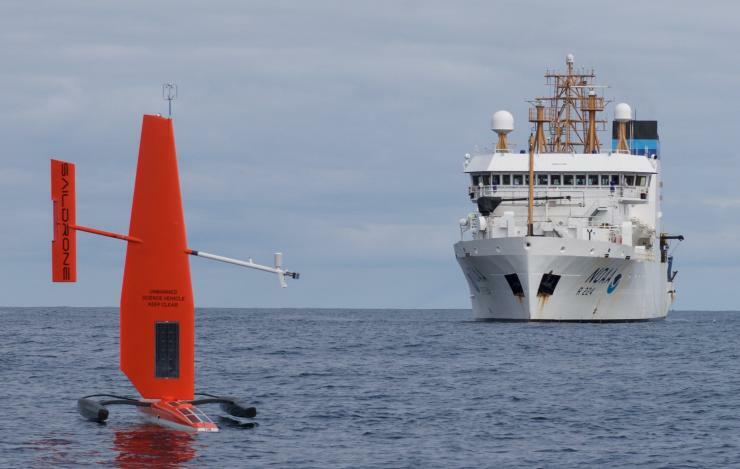 The U.S. hopes to get a clearer picture of its Arctic waters using unmanned marine vehicles and sonar imaging systems. The Arctic Ocean is expected to see a rise in traffic as ice melts and seas warm. Yet according to some estimates, only 4.7 percent of the region is charted to modern standards. Others put that figure even lower, at less than 2 percent. Navigating an already unforgiving environment with out-of-date or insufficient maps can be dangerous and can strain search-and-rescue capabilities in the Arctic. “We have so much work to do when it comes to ensuring that we have accurate mapping and charting,” said Alaska Sen. Lisa Murkowski in her keynote address at the Arctic Circle Assembly in October. Some of the existing soundings in the Arctic were taken by British explorer Capt. James Cook as part of the Royal Navy survey in the 1700s, she said — with a lead sinker. A new project supported by the National Oceanic and Atmospheric Administration aims to bring charts up to date with more modern methods. NOAA’s Office of Coast Survey has partnered with the University of Southern Mississippi to use Saildrones — unmanned vehicles that look like bright-red windsurfing boards — to chart remote and inaccessible waters. The drones will be equipped with sonar multi-beam systems, which send three beams out at once to assemble a clear picture of the seafloor. Previously, Saildrones have been used to gather meteorological and oceanic data. NOAA Fisheries used the drones to measure water temperature and salinity and fish stocks and to track seals and whales in Alaska. Using the drones to collect high-quality sonar images and precise GPS location data suitable for charts would be new, though. NOAA’s Office of Coast Survey is focused on identifying and charting high-traffic areas (and areas projected to become so) in U.S. Arctic waters. Mapping the Arctic has largely to do with priorities, says Adm. Shep Smith, director of the program. “We’re looking for the best bang for our buck. There’s only one kind of buck, but many kinds of bang,” he says. Many different industries and individuals are interested in having a clearer picture of the Arctic Ocean, including those in fishing, shipping, natural resources, tourism and more. NOAA also uses ships for charting, but they make a lot of noise, which can interfere with acoustic soundings. Buoys and seamount systems don’t make any noise, but they usually stay in one location. Enter Saildrones. They don’t make noise, and they can cover large distances powered by renewable energy. The first drones may begin charting the waters of Florida’s Big Bend, which have similar bathymetry and traffic as the U.S. Arctic, as early as June. If that goes well, they’ll head to the Arctic next. “Much of the U.S. Arctic is unfortunately shallow, which is harder to map,” Smith says. And most survey work takes place along the coast, where vessels are more likely to encounter navigational hazards. Saildrones, which can map depths of 200 meters, may work better than ships in shallow waters — and have fewer risks of running aground. One challenge will be finding a way to power the multi-beam sonar systems aboard the drones. “Multi-beam sonars require a lot of power; Saildrones don’t have a lot of power,” explains Capt. Brian Connon, director of the project at University of Southern Mississippi. The Saildrones themselves are powered by the wind, and their instrumentation and communications systems are solar-powered. The sonar system would similarly be powered by the sun. The company is now working with sonar makers to reduce unnecessary features to make the systems more energy-efficient. The project will also analyze whether the drones can follow a survey plan despite being blown by the wind; if it’s blown off course or sideways, the sonar images may be discarded. “It does have a really good GPS on board, so it can hold its position very well,” Connon says. The opposite problem — not enough wind — could also pose challenges. “It is a first step,” Connon says. If the project works well in Florida and Alaska, Saildrones could also inform charts in other parts of the world. “Especially in a harsh environment like the Arctic, I think they have real potential,” he says.